On Monday we announced our nominees for the awards set to take place at our Birthday Bash sponsored by Metronet UK on Friday 5th February. 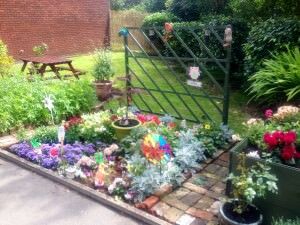 The This is the Place Award is in recognition of a group of residents who have formed and developed a new community project to benefit others in their local neighbourhood. The This is the Place Award is sponsored by Kellogg’s. Kellogg’s established its first UK factory right here in Manchester in 1938. Since 2005, Forever Manchester has provided both strategic and administrative support to Kellogg’s charitable giving projects. The Sedgemoor Secret Garden group, based in Oldham, was set up through our Community Building work in the BGreen area, when our Community Builder Lisa Brown saw two neighbours, Geoff and Brian feeding birds in the communal garden. Lisa noticed the different types of birds that appeared to be in the communal space and got talking to the pair, who were keen birdwatchers. Lisa explained to them about the Cash4Graft funding programme and how by working together and encouraging their other neighbours to get involved, they could apply for a Cash4Graft award to turn this communal land into something really special. They went ahead with the application and the Sedgemoor Secret Flower and Bird Garden became a reality. Over the next couple of months, the neighbours really got stuck in. Raised planters were built for the neighbours that couldn’t bend down. A special wild flower section was planted especially for the bees, a seating area was made (and of course the birds were looked after) – even the squirrels were taken care of with a special platform! A local agriculturalist visited the gardens and said he was surprised to see so many varying pairs of birds in one small area, especially the Jay Birds. Alex Myers the First Choice Homes (FCHO) Neighbourhood Officer entered the garden into the FCHO Garden Competition after seeing how much had been achieved by the neighbours coming together. Independent judges visited the garden in the late summer, then the group were advised that they had reached the final. The Sedgemoor Secret Flower and Bird Garden won 1st place for Best Communal Garden. The son of a resident involved in the project also won Best Young Gardener at the ceremony. Each member has now made friends and they are now looking to attend a regular evening social club, set up by members of the community where residents come together, share a meal and play some board games. Our M32 Free Breakfast runs from Victoria park in Stretford. They started over Chrismtas 2013 with a cash4graft award. 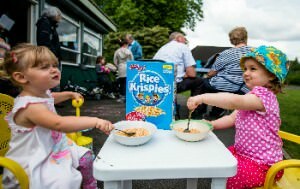 The Idea came about as the organisers realised that some children rely on school breakfast clubs during term time but they are not available during the holidays, however they were opposed to the idea of just targeting people considered in need to avoid stigma and wanted to create a space where anyone from the community can come and share some food. The initial 2 weeks were a success and involved a number of other groups. Due to the success the group was chosen by FM and Kelloggs to receive some more support to operate over the Summer Holidays in 2014 as part of an extended pilot programme alongside some other areas. The group made themselves bigger and better and also organised a Community BBQ to be held every Friday afternoon during the holidays hosted by different people in the community. Summer 2014 was a massive success with almost 100 people showing up on the first day and average daily attendances of around 60. Due to the initial success of this group and its continued success alongside others in the pilot the Kellogg’s scheme was extended again in 2015 to include 3 more areas and engage more local people. The group continues to operate during all school holidays and team up with other groups and initiatives in the local community that bring people together. The club really is a focal point for both children and adults alike during the holidays. Sunflower Stretford received a Cash4Graft award in February 2015. 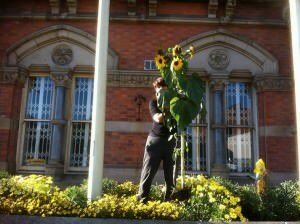 The idea was to fill Stretford with bright sunflowers to make an impact on the urban landscape and bring people together around something fun and positive. The group set up a facebook page and bought a load of seeds and pots for people to get started. The facebook page provided a place where people could get hints and tips off more experienced gardeners in the community and share the trials and tribulations of a trying to grow massive sunflowers in the rain and wind of a British summer. 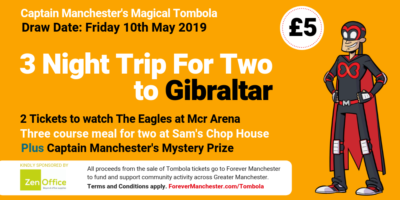 To see which incredible community project wins this award, don’t miss our Birthday Bash on Friday 5th February, which also boasts a three-course meal, entertainment from community projects across Greater Manchester and three further awards.